I had been underwater now for about two hours and the cold was setting in. I was being towed behind a small boat 150 km from shore and counting reef fish as part of my underwater surveys on the Great Barrier Reef. On one side of me the water was about 10 metres deep, bright and colorful with coral and fish and then it plunged down to nearly 1000 metres of icy darkness just beneath me. 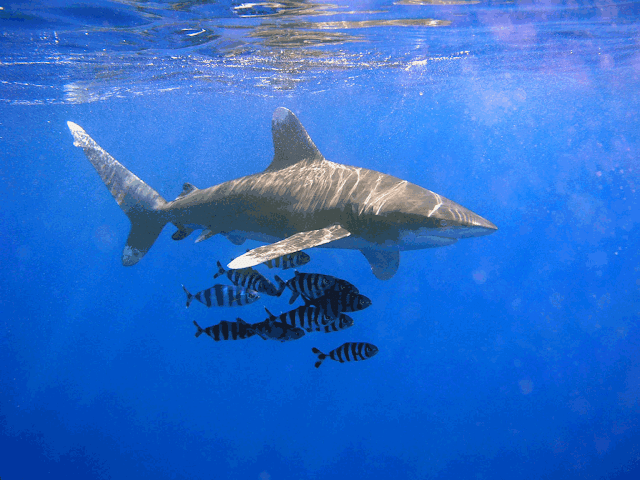 Oceanic Whitetips are often accompanied by pilot fish. I’d had company since I first dived into the inky water. 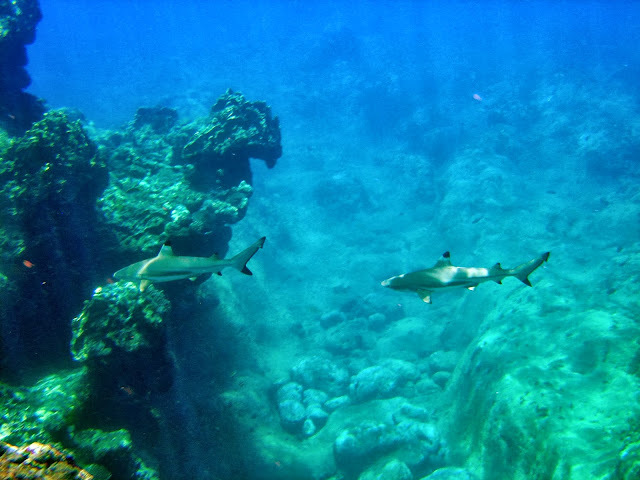 Just on the edge of my visibility a pair of Oceanic Whitetip Sharks, Carcharhinus longimanus, had followed my every move. Famed oceanographer, Jacques Cousteau described them as "the most dangerous of all sharks" and his words echoed in my mind. All I could see of them was the silvery tips of their huge pectoral fins. Growing to four metres and 170 kg and considered to be responsible for most open ocean shark attacks, these elegant fish are nature’s ultimate predator and were my biggest worry. A young Oceanic Whitetip shark shows off its huge pectoral fin. That was 30 years ago and Oceanic Whitetips were always around me. The last time I dived the outer Barrier I was alone. In 1969, Lineaweaver and Backus wrote of the Oceanic Whitetip: "[it is] extraordinarily abundant, perhaps the most abundant large animal, large being over 100 pounds [45 kg], on the face of the earth". Now overfishing has brought about a catastrophic collapse in their numbers. The International Union for the Conservation of Nature lists them as “Critically Endangered” in the Northwest and Central Atlantic and “Vulnerable” globally. But the Oceanic Whitetips are not alone in this tragedy. "There is mounting evidence of widespread and ongoing declines in the abundance of shark populations worldwide, coincident with marked rises in global shark catches in the last half-century," say Mizue Hisano, Professor Sean Connolly and Dr William Robbins from the ARC Centre of Excellence for Coral Reef Studies at James Cook University. 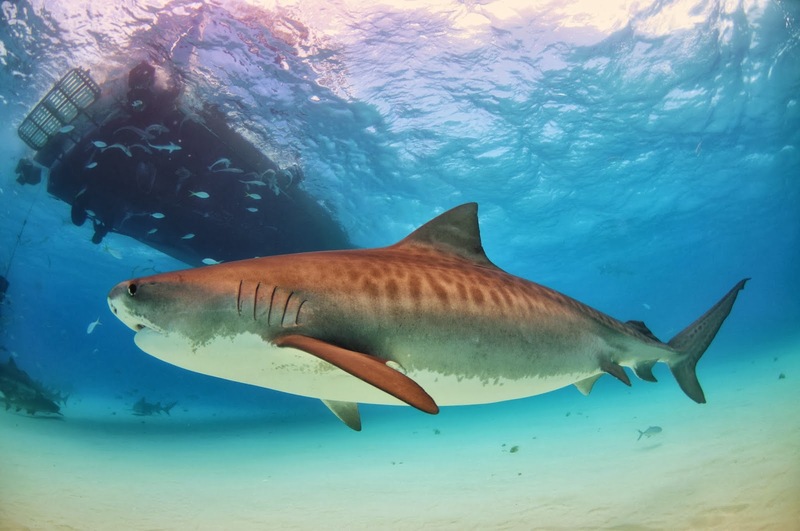 Tiger Sharks are heavy bodied but capable of bursts of speed that don't fit their usually sluggish behavior. "Overfishing of sharks is now recognized as a major global conservation concern, with increasing numbers of shark species added to the International Union for the Conservation of Nature's list of threatened species," they say in the latest issue of the science journal PLos ONE. Interest is growing worldwide in protecting these sharks. Now more species have been added to Appendix II of the Convention on International Trade in Endangered Species of Wild Fauna and Flora (CITES). This happened during the Conference of Parties meeting in Bangkok, Thailand, March 3-14 of this year. Sadly, the nations of the world were voting on the restriction of international trade only in endangered sharks. This may not be enough as the fishery will quickly shift to other less desirable species to meet its growing demands. Oceanic Whitetips were once the most common large predator on the planet but fishing is now pushing them toward extinction. Shark meat is low priced so fishermen try to fill their boats with only the valuable fins. Contrary to a UN Resolution to ban the practice, the fins are usually sliced off the shark while it is still alive. The cheaper body is thrown back into the ocean and the shark, unable to swim, dies slowly. Shark fin purchases are increasing at the rate of five percent per year in mainland China. Globally, catches have more than tripled in the last 50 years even though sharks are becoming harder to catch as their numbers fall. A finned shark lies helpless on the bottom facing a slow death by starvation. Outlawed as cruelty by many countries there is no enforcement. Dr. Shelley Clarke’s estimate of sharks harvested for their valuable fins is between 26 million and as many as 73 million sharks each year worldwide. Her best estimate is 38 million sharks killed annually. This number is an astonishing three to four times higher than is reported by world markets to the United Nations (FAO). Scientists from the International Union for the Conservation of Nature (IUCN) are shocked to find that more than half of many large shark species have virtually disappeared in the last 30 years. 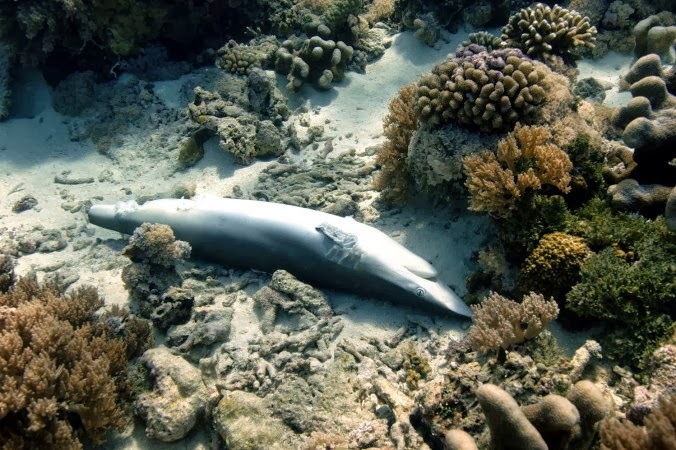 The collapse in shark numbers is due to the unprecedented demand for shark fins. Each hour about 5000 sharks have their fins sliced off and their bodies thrown into the sea. At current rates of decline, there will be no shark fins and unfortunately very few sharks by 2030. Will the CITES Conference in Bangkok be able to protect the Oceanic Whitetip? I’m not so sure. A research team, which included researchers from Microwave Telemetry, Inc., the Cape Eleuthera Institute, and the Institute for Ocean Conservation Science at Stony Brook University, attached satellite tags to mature oceanic Whitetip sharks in The Bahamas. The tags recorded depth, temperature, and location for pre-programmed periods of time. At the end of the time period the tags self-detached from the sharks and reported their data to orbiting satellites. Reef sharks cruise the reef slope in Great Barrier Reef waters No species are safe from overfishing. Their findings, published February 20, 2013 in the journal PLoS ONE, show that some of these sharks roamed nearly 2,000 kilometers from the spot where they were caught, but all individuals returned to The Bahamas within a few months. 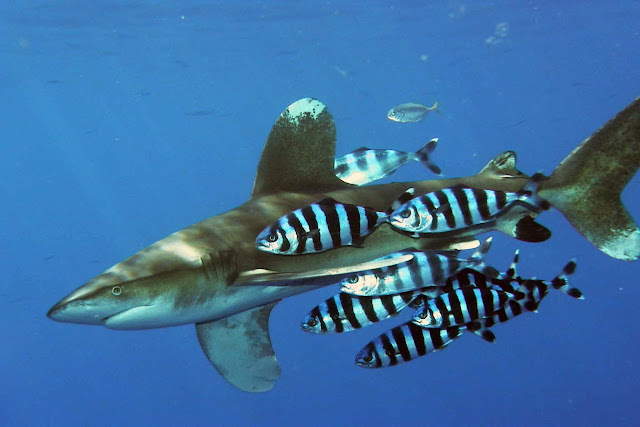 Protecting endangered Whitetips in signatory countries will have little effect if they travel into unprotected seas. 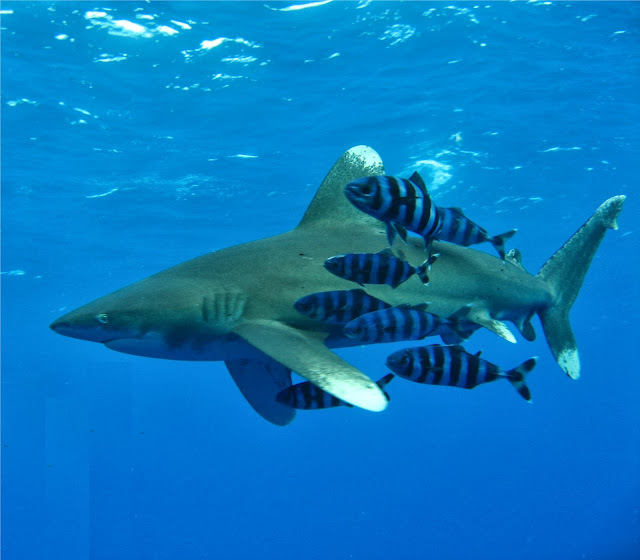 Of the eight tagged Oceanic Whitetip sharks tracked for more than a month, three stayed within the Bahamas Exclusive Economic Zone (EEZ). The other five sharks made long-distance movements outside of the EEZ with one traveling as far as Bermuda. So why are shark fins attracting such attention? Shark fin soup is a delicacy served at Chinese weddings and other celebrations for centuries (since Ming Dynasty). Recently this expensive product has become part of business dinners in Southeast Asia. Because the fins are the most expensive part of the shark, having them on the menu is a sign of prosperity. Oceanic Whitetips belong to an ancient group of fish and produce from one to 15 pups after a year’s gestation. They are unable to produce enough pups to balance the high fishing rates and so the number of sharks gets smaller each year. But the Oceanic Whitetip is at the top of the food chain and its abundance regulates the ecological relationships of all the marine life in the complex web of predator and prey beneath them.